Wilson Law Offices concentrates their practice in the area of malpractice and Nursing Home Abuse and Negligence, personal injuries, and social security claims. Since 1994, C. Richard Wilson has been active in the area of nursing home negligence and/or abuse. In researching the applicable law and investigating the facts involved in claims and cases, it became evident that a great deal of the information we have learned would be extremely helpful and useful to people investigating a nursing home for the purpose of making decisions for themselves, or loved ones, as to placement or residency. There is a tremendous amount of information available to people having to make these types of decisions, from governmental agencies to local and community non-profit groups. These are important life issues that should be addressed by informed decisions. 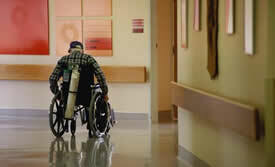 Click here view How to select a Nursing Home. (pdf format) To download this paper, right click the link and select Save Target As and save it to your computer.